Support Siouxland Soldiers – Page 18 – Support Siouxland Soldiers serves all Siouxland Veterans and Military Families. Support Siouxland Soldiers Sends Love Overseas – News, Weather and Sports for Sioux City, IA: KCAU-TV.com. As Valentine’s Day approaches, for some Siouxland families, sending a card packed with love has more miles to travel this year. That’s because it’s going overseas, to sons and daughters called to duty for the love of their country. Support Siouxland Soldiers is at it again, packing up a little bit of love, for soldiers, fighting in the line of fire. They’re the sights and sounds of support. The Sioux City based group, Support Siouxland Soldiers is packing up these boxes with necessities, and sweets for Valentines Day. The group puts together packages for almost every holiday, but this is Anita Collier’s first package. Her son just landed in Kuwait yesterday. Dawn Breece’s son caleb is also taking his turn overseas, he’s being deployed for a year. “When I found out about this I was excited because there are so few things we can do for military, and since my son is in the army and he’s stationed in Baghdad, Iraq, I want to get involved and not only send things to him, but support the other soldiers,” says Breece. Dawn says support by way of sweets, is the least they can do for the military men and women serving our country. That’s why many of these family members are taking an hour out of their Saturday for packing for their soldiers, to make at least one day away from home a little easier. 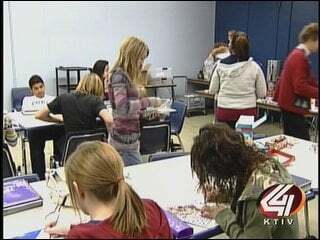 Support Siouxland Soldiers wrapped up more than 50 boxes to be sent overseas within the next week. Channel 9 KCAU-TV is a proud sponsor of Support Siouxland Soldiers. Support Siouxland Soldiers Earns Project Homefront Award – News, Weather and Sports for Sioux City, IA: KCAU-TV.com. They’ve boxed and shipped hundreds of care packages, but Support Siouxland Soldiers is about more than just a present in the mail. It’s a group that has turned to each other for help when their spouse, parent or friend has gone overseas. Sandy Fleck joined the group because she wanted to find a way to help her son Tanner, but it’s now the fun she has during the get togethers that keeps her going. Many of the soldiers, including Shawn and Tanner, are back from the middle east. As a result, Support Siouxland Soldiers is refocusing its purpose. The group will still make care packages every other month, but their goal is to offer fun activities for military families. For more on that, log onto their web site at supportsiouxland soldiers.com. Support Siouxland Soldiers Holds Brown Bag Drive For Deployed So – News, Weather and Sports for Sioux City, IA: KCAU-TV.com. Over 300 deployed soldiers from the area will soon be getting a surprise, and they’ll have many of you to thank. Support Siouxland Soldiers held a drive today at the Southern Hills Hy-Vee. They collected hygiene products, food and other goods from Hy-Vee shoppers. A lot of the soldiers will be coming home in July, so, in honor of Armed Forces Day today, Support Siouxland Soldiers decided to end their stint with a bang. Starting at 6:30pm on June 2nd, the group will be packaging the donations at the Armory by the Sioux Gateway Airport and then sending them out. Anybody is welcome to come and help. You can also specialize a package for a particular soldier. Thank you, Tires Tires Tires and the Siouxland Community for helping us pack and send $10,000 worth of supplies and snacks to our Siouxland Service Members deployed overseas!! Support Siouxland Soldiers is a community non-profit (501c3) organization whose mission is to support members of the Armed Forces, past and present, their families and the Siouxland community. The primary means of our mission is to send packages to deployed military personnel, host family-friendly monthly events and by partnering with Siouxland businesses, schools, churches and organizations to bring support to the four thousand – plus members of the Armed Forces and military families of the Siouxland area. Increasing the morale of the troops during deployment by sending Care-Packages is the core and origin of Support Siouxland Soldiers mission. We’ve organized “Care Pack” events every other month since 2007 and to date have sent over four thousand care-packages. This is made possible through partnerships with community businesses, organizations, churches and schools that help us provide snack and hygiene items which are included in the care – packages, as well as providing all of the materials and postage for shipping . We ship care – packages to all branches of the Armed Forces and invite families to customize care-packages for their specific service member. SIOUX CITY, Iowa (KTIV) May 2009 – It’s a special treat for Siouxland soldiers coming from some of their youngest supporters. 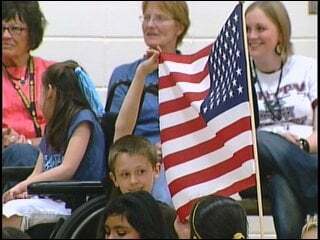 Friday, Sioux City’s Unity Elementary hosted a special assembly to present the non-profit organization “Support Siouxland Soldiers” with items to be packed in the Armed Forces Day care-packages. Special guests included those from the 1-113th Cavalry. Organizers say it’s a great opportunity for kids to get involved with those serving their country. “And we use those donations to pack boxes for deployed military personnel,” said Sandy Fleck, Support Siouxland Soldiers. Saturday is Armed Forces Day, and donation boxes will be packed at the Sioux City “Tires Tires Tires” location on Gordon Drive, from ten and two. Volunteers, and donations, are welcome. SIOUX CITY, Iowa (KTIV) — A group of East High School students are giving support to Siouxland Soldiers. Students from Freshman Fusion, an East High mentoring program, organized a school wide collection of supplies for Siouxland Soldiers. They collected donations from faculty, staff and students to purchase some items too. The supplies will be used to make care packages that Support Siouxland Soldiers will assemble for area military members for the holidays. Students also signed cards thanking soldiers for their service. “It makes you feel good because, knowing that they are out there helping us and we and just give them something to make them feel better,” said Emilie Olveda. The items collected will be packed this Saturday at the Holiday Care-Pack Event that Support Siouxland Soldiers is holding at the 113th Calvary Armory. Then the care packages will be sent out to any deployed area and arrive just in time for the holidays.